Terroir is a hot topic in the wine world. Never has such an elusive concept caused such division amongst growers, experts and consumers of wine, but what’s the big deal? Well, in the parlance of Bill Shakespeare; nature or nurture, that is the question. Terroir comes from the French ‘terre’, or ‘land’, and is defined by the clever folk at Wikipedia as being a “set of special characteristics that the geography, geology and climate of a certain place, interacting with plant genetics, express in agricultural products” such as wine. If that sentence bores the life out of you then rest assured that is as scholarly as I’ll get, but it is an important debate. Whether terroir influences wine is axiomatic, but to what extent terroir influences the quality of wine is a contentious issue. The traditional school of thought is that the different aspects of the physical environment are the key factors in influencing the aromas and flavours of wine. The soil, sub-soil, geology, climate and such are what makes a great wine great, and thus wine makers from Bordeaux will produce great wines and those from lesser regions will invariably produce plonk. As the saying goes, it’s not possible to make a silk purse out of a sow’s ear. The more contemporary school of thought focusses on the wine-making side. That is to say that the viticultural and oenological expertise that are applied to the process of maturing the fruit, handling and processing the grapes has just as much of an influence on the tastes and aromas and is as big a quality factor. Championed by the Valéry Michaux and Robert Parker’s of the wine world it is recognition that at the very least people can make or break good terroir, one that Gavin Monery from urban winery London Cru is happy to endorse. “In practical terms people are missing a trick when they talk about terroir. A lot of it is cultural. There are vineyards in Burgundy that lie less than ten miles apart but showcase remarkable differences in the wine they produce, namely because the techniques in the cellar are different and they use different wine making practices that have been passed down through the ages,” Gavin said. Born and raised in Australia Gavin’s career began in the cellars of Margaret River before he moved to the biodynamic Cullen Wines where he helped craft some of Australia’s best Cabernet blends along with top flight Chardonnay and Sauvignon Blanc/Semillon. In Europe he has completed three harvests in Burgundy (Alex Gambal, Remmoissenet and Chavy-Chouet) and one with the esteemed Jean-Louis Chave in the Rhone, but it was his tie-up with Roberson Wines in 2008 that was to lead him to setting up an urban winery in SW6. 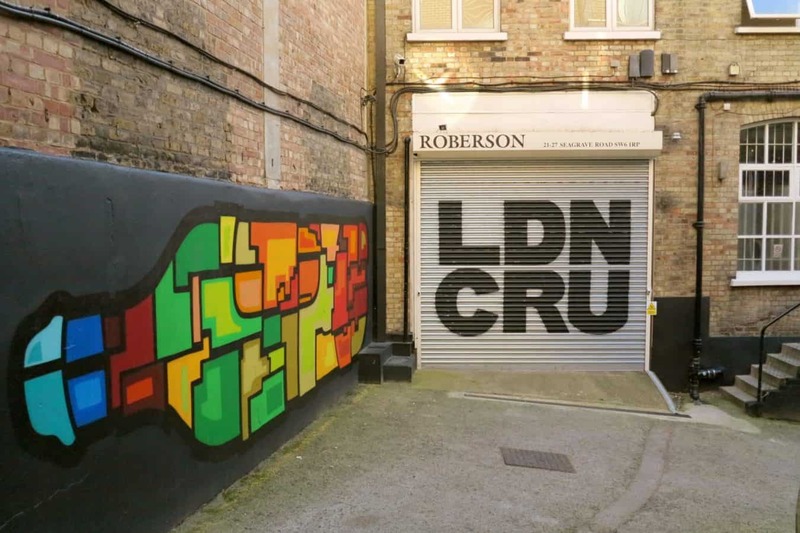 Launched in November 2013 London Cru is the capital’s first urban winery with the first batch of wine now on sale after a manic year constructing the boutique winery and sourcing grapes from across Europe to make the first batch of SW6 wines. The West Brompton winery is hidden just off Lillie Road across the road from The Atlas pub with views of Stamford Bridge peeking out in the background. Glistening machinery hugs the walls of the winery with framed pictures of the growers and their vineyards and wooden barrels neatly piled up setting the rustic tone of a traditional winery. Gavin keeps a close working relationship with the vineyards used at London Cru that span from the south of France to Spain and Italy. When the fruit is ready to pick he flies out an overseas the initial sorting of the grapes before they are transported in coolers, arriving in London in less than 48 hours to be processed. The quality of the wine and the depth of characteristics were apparent from our first taste of SW6 Chardonnay, a refreshing, citrusy wine that shouted Burgundy (odd, the terroir advocates would say, given that it’s from Roussillon). Victoria Moore’s notes of a “gentle oak corset” with “sunniness that just begins to breach the t-word (tropical) as you get towards the end of the mouthful” sum it up perfectly. I can’t beat that, so there you go. Next up was SW6 Syrah which had Gavin written all over it. More delicate Northern Rhône than heavyweight Australian Shiraz the wine was fruity and accessible with featherweight tannins and enchanting purity. This is the sort of wine you just want to pop the cork on. An evening spent with friends with a Mediterranean influenced dish, fresh bread and olives would create quite the temporal blessing. We dipped into the SW6 Cabernet Sauvignon that felt “like a big, open, rectangular cardboard box that gently gives you all it has to offer on first sniff” (Moore again, sorry! ), before moving on to my champion of the night, SW6 Barbera. The Piemonte red is made from a mixture of mainly old and some new oak and was by far the most robust wine of the evening, but still wonderfully accessible. The palate, already tantalised by its SW6 counterparts, worked like a code braking machine at Los Alamos, finding berries at one moment before stumbling upon sharp acidity and fine tannins. My mind went to autumnal evenings eating game pie. Before we left we sampled a blend of this summer’s reds as well as a Chardonnay from the barrel. Even at this early stage the potential of the 2015 wines was apparent. The fruitiness and balance conclusively proved that you can grow good wines in Europe, but make great wines in London. For me, tonight put the terroir debate to bed. People can make or break good terroir. London Cru makes it. Jack Peat authors ‘Of Wood and Region‘, a journey across Europe drawing on the similarities of the most renowned drink regions of the world.